Masks lend a smooth complexion to the user. Masks are more effective after a steam facial. 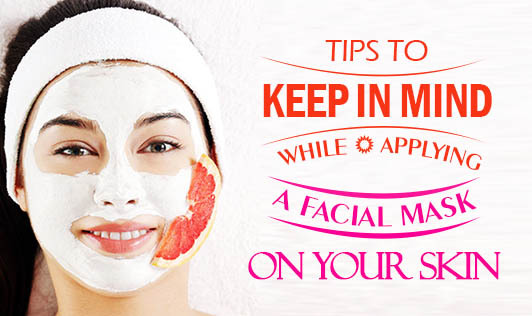 Below are some handy tips to be kept in mind before you treat your skin to a mask. 1. If you are treating your skin to a face mask for the first time, you may find that you develop a few blemishes immediately after or sometimes even a week later. No need to be worried about this as it is indicative of the treatment working well! 2. Masks must always be used on clean skin and should be evenly applied. 3. Apply a face mask when the skin is warm. 4. Mask application must be avoided around the eyes and mouth. 5. For dry, sensitive, and combination skin types, the mask should be washed off after 10 minutes. 6. Oily skin needs a mask for a full 15 minutes before rinsing off. 7. Vary treatments from season to season. 8. Once you know your skin type and its limitations, you can decide on a face mask made from a variety of flowers, fruits, vegetables, and dairy products.